The Ariane 6 launcher will provide Arianespace with new levels of efficiency and flexibility to meet customers’ launch services needs across a full range of commercial and institutional missions. To ensure Arianespace’s continued competitiveness, this next-generation launcher has been conceived for reduced production costs and design-to-build lead times, all while maintaining the quality and reliability that have made Ariane 5 an industry leader. Ariane 6 features a modular configuration based on core stages powered by lower and upper liquid propellant modules, which are supplemented by either two or four strap-on solid rocket motors. 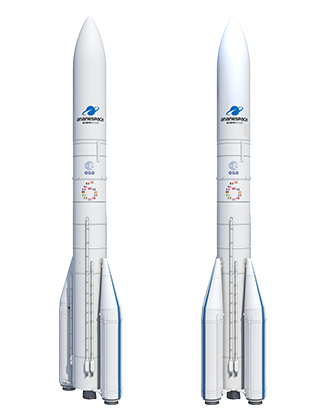 Enhancing Ariane 6’s competitiveness is the series production of its rocket engines and a technology-sharing approach with Arianespace’s Vega C – particularly this lightweight launcher’s P120 engine that also will be used in Ariane 6’s solid rocket motors. ArianeGroup is prime contractor and design authority for Ariane 6, while the European Space Agency (ESA) oversees procurement and architecture of the overall launch system.